The only way to accurately measure and test the length of the chamber of the rifle. Essential when chambering a new barrel to ensure a tight, accurate, safe chamber. Whenever you buy a used gun, always check the headspace before firing. Forster gauges are made to SAAMI specs. 100-010-715 - This gauge is .0005 inch (5/10,000 inch) under 7.62 NATO specification for NO-GO dimensions for safety. SPECS: Machined Steel. Size varies with caliber and gauge style. 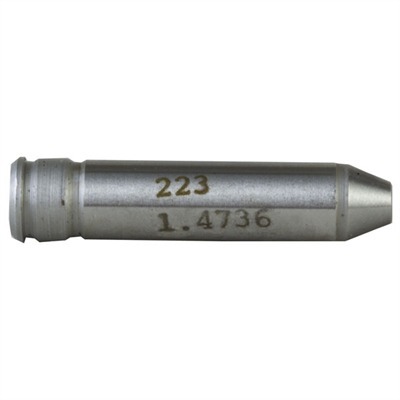 NOTE: Gauges Interchangeable between calibers have same Stock #. .30-30 Cartridges are .219 Wasp, .219 Zipper, .22 Sav HP, .30-30, .32 Win Spl, .32-40, .375 Win and .38-55. .30-06 Cartridges are .25-06, .270 Win, .30-06, 8mm-06, .338-06 and .35 Whelen. Magnum Cartridges are .257 Weatherby, .264 Win, 6.5 Rem Mag, .270 Weatherby, .275 H&H, 7mm Rem Mag, 7mm Weatherby, 7x61 S&H, .300 H&H, .300 Win Mag, .30-338, .300 Weatherby, .308 Norma, 8mm Mag, .338 Win, .340 Weatherby, .350 Rem Mag, .358 Norma, .375 H&H, .416 Rem Mag and .458 Win.